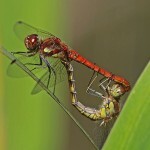 We start this year’s programme of Froyle Wildlife events with Dr. Bill Wain’s illustrated talk on Tuesday 15th March which will introduce us to ‘A Dragonfly’s world’. Who hasn’t delighted in watching dragonflies patrolling purposely over a pond or delicate damselflies fluttering along streamside vegetation but did you know there are nearly 6,000 species worldwide? Around 40 species breed in Britain many of which have differing needs. Bill’s talk aims to shine a light on habitat and management requirements for these beautiful insects whose ancestry goes back over 300 million years. All welcome to come along at 7.30pm in the Village Hall.